French writer. Alexandre Dumas (Thomas-Alexandre Dumas Davy) was born 24 July 1802 also known as Alexandre Dumas, père. His father, General Thomas-Alexandre Davy de la Pailleterie, was born in the French colony of Saint-Domingue (present-day Haiti) to a French nobleman and an enslaved African woman. In 1816 He was taken by his father to France. Thomas-Alexandre Dumas Davy was educated in a military school and joined the army as a young man. In 1822, after the restoration of the monarchy, the 20-year-old Alexandre Dumas moved to Paris. He acquired a position at the Palais Royal in the office of Louis-Philippe, Duke of Orléans. 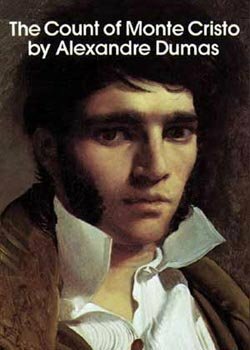 As an adult, Thomas-Alexandre used his mother’s name, Dumas, as his surname after a break with his father. Dumas’ father’s aristocratic rank helped young Alexandre acquire work with Louis-Philippe, Duke of Orléans. While working for Louis-Philippe, Dumas began writing articles for magazines and plays for the theatre. Dumas began his career by writing plays, which were successfully produced from the first. He also wrote numerous magazine articles and travel books; his published works totalled 100,000 pages. His first play, Henry III and His Courts, produced in 1829 when he was 27 years old, met with acclaim. The next year, his second play, Christine, was equally popular. These successes gave him sufficient income to write full-time. Dumas was promoted to general by the age of 31, the first soldier of Afro-Antilles origin to reach that rank in the French army. He served with distinction in the French Revolutionary Wars. He became general-in-chief of the Army of the Pyrenees, the first man of colour to reach that rank. Although a general under Bonaparte in the Italian and Egyptian campaigns. In 1830, Dumas participated in the Revolution that ousted Charles X and replaced him with Dumas’ former employer, the Duke of Orléans, who ruled as Louis-Philippe, the Citizen King. Until the mid-1830s. After writing additional successful plays, Dumas switched to writing novels. Although attracted to an extravagant lifestyle and always spending more than he earned, Dumas proved to be an astute marketer. As newspapers were publishing many serial novels, in 1838, Dumas rewrote one of his plays as his first serial novel, Le Capitaine Paul. He founded a production studio, staffed with writers who turned out hundreds of stories, all subject to his personal direction, editing, and additions. Between 1839 and 1841, Dumas, compiled Celebrated Crimes, an eight-volume collection of essays on famous criminals and crimes from European history. He featured Beatrice Cenci, Martin Guerre, Cesare and Lucrezia Borgia, as well as more recent events and criminals, including the cases of the alleged murderers Karl Ludwig Sand and Antoine François Desrues, who were executed. Dumas collaborated with Augustin Grisier, his fencing master, in his 1840 novel, The Fencing Master which concerns Grisier’s account of how he came to witness the events of the Decembrist revolt in Russia. The novel was banned in Russia by Czar Nicholas I, and Dumas was prohibited from visiting the country until after the Czar’s death. In the 1840s, Dumas founded the Théâtre Historique in Paris and had a numerous assistants and collaborators, including Auguste Maquet who Assisted during the writing of The Count of Monte Cristo and made substantial contributions to The Three Musketeers and its sequels, as well as to several of Dumas’ other novels Including the short novel Georges which uses ideas and plots later repeated in The Count of Monte Cristo. Many of his historical novels of high adventure were originally published as serials, including The Count of Monte Cristo, The Three Musketeers, Twenty Years After, and The Vicomte de Bragelonne: Ten Years Later. His writing earned him a great deal of money, but he was frequently insolvent, as he spent lavishly on women and sumptuous living. By 1846, he had built a country house outside Paris at Le Port-Marly, the large Château de Monte-Cristo, with an additional building for his writing studio. However two years later, faced with financial difficulties, he sold the entire property. In 1851 King Louis-Philippe was ousted in a revolt and, Louis-Napoléon Bonaparte was elected President and Dumas fled to Brussels, Belgium, asBonaparte disapproved of the author. Upon leaving Belgium, Dumas moved to Russia for a few years where He published travel books about Russia, before going to Italy. In 1861, he founded and published the newspaper L’Indipendente. In March 1861, Italy was proclaimed a kingdom, with Victor Emmanuel II as its king. Dumas travelled there and for the next three years participated in the movement for Italian unification. He founded and led a newspaper, Indipendente. Returning to Paris in 1864, he published travel books about Italy. sadly Alexandre Dumas died 5 December 1870 And was buried at his birthplace of Villers-Cotterêts in the department of Aisne. His death was overshadowed by the Franco-Prussian War. Changing literary fashions decreased his popularity and his works have been translated into nearly 100 languages, and he is one of the most widely read French authors. His novels have also been adapted into approximately 200 films. Dumas’ last novel, The Knight of Sainte-Hermine, unfinished at his death, was completed by a scholar and published in 2005, becoming a best seller. It was published in English in 2008 as The Last Cavalier.